Jennifer Lawrence as Katniss Everdeen in ‘The Hunger Games’. The first real event movie in a year littered with them, The Hunger Games is poised to inherit the mantle of “Next Great Young Adult Novel Franchise Turned Blockbuster Film Franchise” from the concluded Harry Potter series and the wish-it-never-had-been Twilight series. 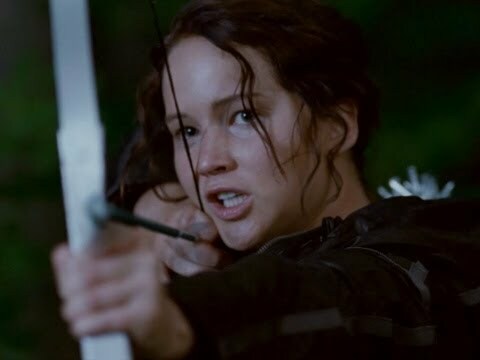 Many have tried and failed (we’re looking at you, I Am Number and Percy Jackson), but The Hunger Games mostly deserves the honor; it delivers the goods, although it is a little soft around the edges and lacking in bite. Promising young actress Jennifer Lawrence (nominated for an Academy Award for her performance in Winter’s Bone) is well-cast as Katniss Everdeen, the fearless, independent, resourceful, and somewhat prickly heroine of Suzanne Collins’ trilogy of young adult novels. Katniss lives in a totalitarian, alternate-universe version of the US, in an area of the Appalachias now known as District 12, still a dirt-poor mining region whose inhabitants struggle to survive. It doesn’t help that for decades the Capitol has developed and maintained the Hunger Games, an annual bloodsport event that owes a little to the gladiatorial games of Rome, the Greek tale of Theseus and the Minotaur, and Mad Max: Beyond Thunderdome: Each year, one boy and one girl between the ages of 12 and 18 are selected from each of the 12 districts via lottery and sent to the Capitol to battle in a televised duel to the death in an elaborate outdoor arena. Only one survivor is allowed, and his or her district will benefit in food and goods. Katniss volunteers for the games when her younger sister, Primrose (Willow Shields) is selected; she joins a baker’s son, Peeta (Josh Hutcherson) as the district’s “tributes”. Over the course of two weeks, the two are put through perfunctory training by alcoholic former-tribute Haymitch (Woody Harrelson), primped and preened by a team of stylists led by Lenny Kravitz and an Elizabeth Banks (both excellent), paraded before a decadent audience in a grotesque take on the Olympic opening ceremonies, and subjected to interviews with sleazy master of ceremonies Caesar Flickerman (Stanley Tucci, flashing a brilliantly predatory talk show smile). Then the games begin. The Hunger Games bears an undeniable resemblance to the Japanese cult classic Battle Royale (as well as American Idol, Survivor, 1984, The Running Man, and a ton of other influences that are cleverly exploited), an equally stark tale of a dystopic future regime that keeps its population in line by subjecting its children to an annual death match. Battle Royale‘s commentary was drowned out by its excessive and almost cartoonish violence. The Hunger Games (rated a mild PG-13) errs on the side of caution in that regard — a smart move, lest it turn such prime material in exploitation-film fodder — but it also mutes the other grim details that define its world. Katniss and her folk don’t look much like the half-starved laborers they’re supposed to be; Haymitch’s alchoholism is glossed over; the heavy-handedness of President Snow (Donald Sutherland) is intimated but never quite illustrated — he’s more stern grandfather than oppressive dictator. Director Gary Ross (Seabiscuit, Pleasantville) does an excellent job in bringing Collins’ world to life visually (though he lacks a distinctive style) and delivers some well-designed action beats (especially the free-for-all that kicks off the games), but arguably he’s used to material that’s less grim than this; he pulls too many punches in adapting a story known for its ability to deliver a gut-punch or two. Ultimately, it’s the cast that brings the movie to life, especially Lawrence. Much like ladies in the recent Haywire and last year’s Hanna, Katniss is woman who doesn’t need to be rescued and who is able to survive on her own very sharp wits. She rescues not only herself, but also her love interest. In your face, Bella.